Markets fail to sustain above 6760 and sell off. Advance decline was negative and selling was evident in most stocks. 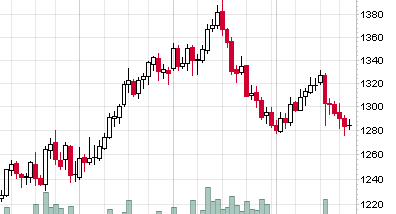 EOD charts show formation of large bar with a small body. In current context, this is a bullish sign. 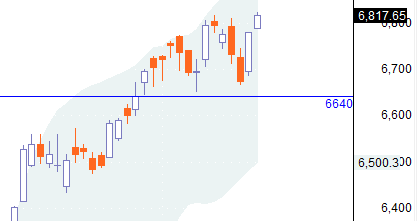 Note that markets are close to some good supports. NIFTY open interest indicates support at 6500 and resistance at 7000. Interestingly, highest OI is now in the 7000 call followed by 6500 put. NIFTY trend is up with support at 6640. The market as of now is still a buy on dips market. Option writing points to support at 6500 and resistance at 7000. Tomorrow, expect strength if market can hold above 6760 spot. 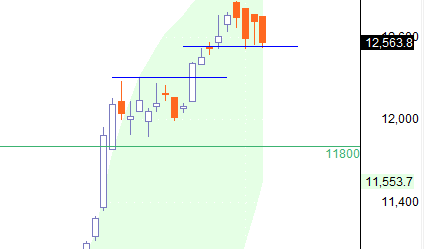 We had a poor follow through post Friday's sell off. This means the correction is likely to get over sooner than later most probably around 6700 levels. If at all this level breaks, the market will offer a good buy-on-dips opportunity between 6600 and 6700. I rarely see RSI but today I saw out of curiosity and voila... we have negative divergence on daily charts. The reason I don't see this is when you are in markets long enough the price behaviour will start hinting at some reversal. You can actually sense some distribution happening. Possible trend reversal on EOD charts as markets close below 3 days' low. Next week, a fast close below 6640 will mean confirmation of trend reversal. Note that there were warnings of this for past week days... smaller bars, no blast off rally at new highs, option writing pointing to strong resistance at 7000 and possibility of a deep correction (without breaking 6000). Current OI points to resistance at 7000 and support at 6500-6000. Initial bias was bearish. First sell signal is shown in the rectangle/ box where markets attempted to cross the high of the first breakout bar and failed. Second signal is on break of day's low 6852F. 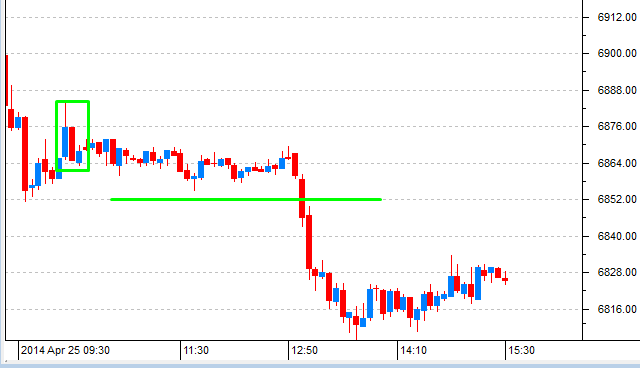 Trend is down with support at 1280... expect correction to 1240 if support breaks. One blog I read quite regularly because of the methods is uttamsmethodofselling.blogspot.in/. This is an excellent blog and a must read for those who like to improve on their trading skills. Option writers are preparing for a big range and volatility in MAY. They are not expecting markets to cross 7000 in MAY and not break 6000 on the downside. Since markets are close to the upper range than the lower range, chances of a correction cannot be ruled out. To negate this scenario, open interest at 6000 and lower puts should be highest. Trend is up with support at 6640... note that trend appears as if it is weakening. The reason is we are at new highs and while markets should have blasted this is not happening and we are seeing smaller bars. So markets are making new highs but there is no follow through buying. Option writing points to support at 6000 and resistance at 7000. The deep support may mean that writers are expecting limited upsides but a big correction from current levels. 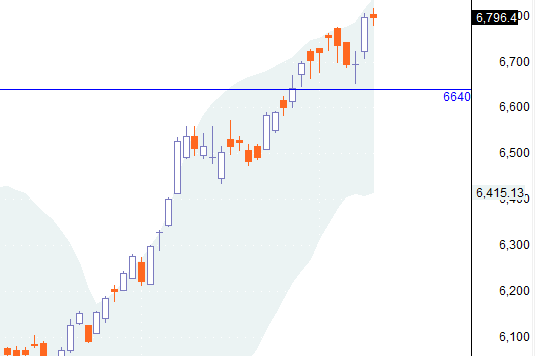 Trading range 1000 points in MAY? They are not expecting markets to cross 7000 in MAY and not break 6000 on the downside. Now 1000 points is a big big range. This automatically means limited upsides from here while indicating that markets may correct substantially. 1.We will get a better picture on FRIDAY after expiry of current series. 2.Options are very expensive so it may not be easy to earn money. 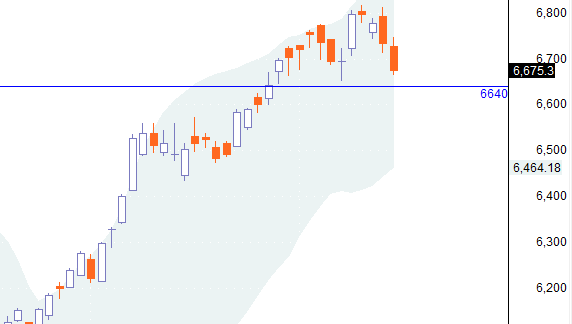 Trend is up with support at 6640 spot. Note strong resistance in the region 6835 spot. 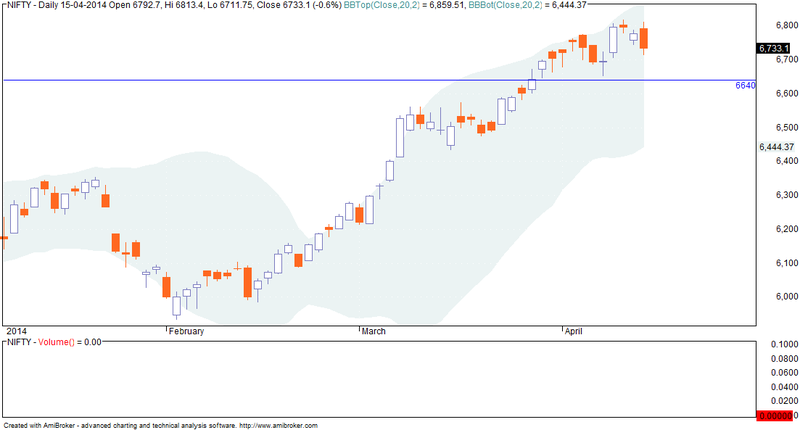 Break of 6640 will lead to a correction to 6300-6400 levels. The market will remain a buy on dip but as usual one should wait for a buy signal and then buy. Trend is up with support at 6640. It is expected that 6600 will not break this series. Since the trend is up, trade long... don't short. Breakout above 6820F (2.15pm) was bullish. But this did not give much gains and position got closed on trailing SL. 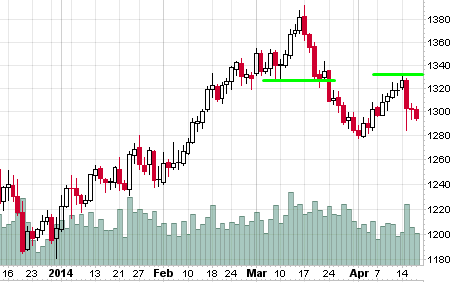 After breaking support in MARCH and trending down, GOLD has now rallied and formed a lower swing high. Crossover and holding above 1330 will be bullish else consider trend as down. This was a short week... it started a day later and ended a day earlier. Trend is up with support at 6640. Next week, close above 6820 can see a rally to 7000-7200 levels. Option writing clues point to support at 6700... apparent resistance at 6800 has vanished. There were 2 buy signals today... one on crossover of 6720F and second on crossover of 6760F. A question may arise that when the last 2 days trend was down, how could one initiate a long call? The justification for this is that markets (on EOD charts) were very close to support and a bounce was due. The big bar on 5 min charts (6720F crossover) was a confirmation of intraday bullishness. CLSA says that as per technicals the BSE benchmark Sensex is all set for 39,707 level, an upside of over 75 per cent from its present level of 22,330.80 over 12-24 months. 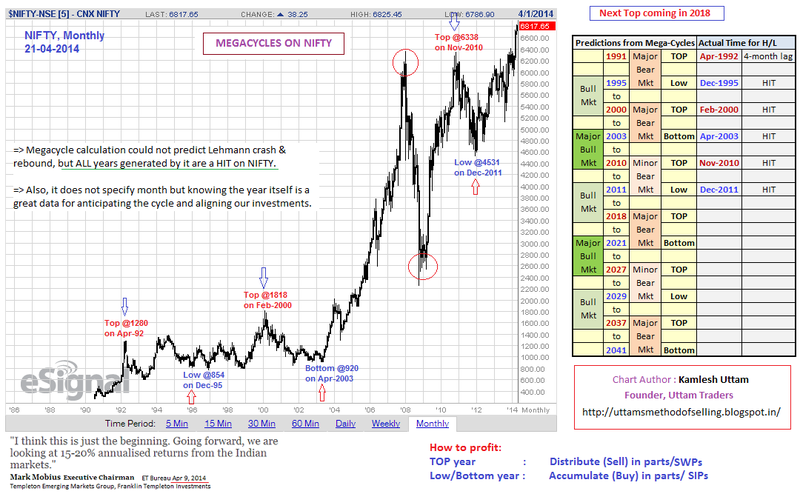 My view: I am expecting a breakout in 2014/ 2015 and we will have a rally similar to the one in 2003-2008 when the nifty shot from 1000 to 6000. Also, swing traders and investors will make far more money than day traders. This is true of all markets. Trend is up and will reverse on close below 12400 spot. Trend is up above 6640 spot. 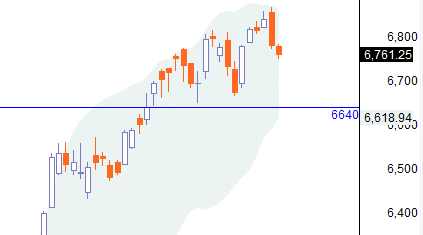 Real support will come in around 6600 spot... this is the level where there is substantial put writing. Note that there is a change in sentiment (first time) and 6800 now has the highest open interest. This may mean that markets will not cross 6800 this month. Interestingly, last few days markets was going up and so was VIX. Now markets dropped today and VIX dropped by 2%. Trend is up with support at 6640. 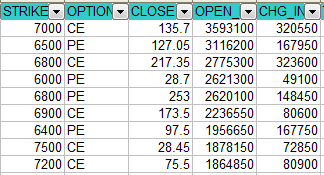 Option writing points to support at 6700-6600 though we witnessed a cut in open interest in these levels. There is however no signs of aggressive call writing so writers are not bearish as of now. The Dow Jones has been trading in a range between 15300 and 16600 for quite some. It has now lost 600 points off the highs and has also broken and closed below the recent swing low. 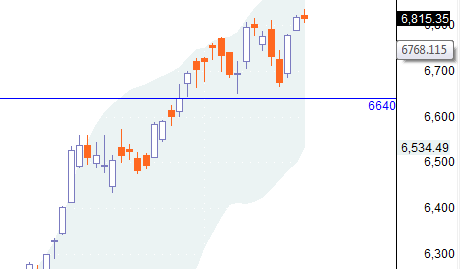 On daily charts, the trend is up with support at 6640. Note that despite a gap down opening, the low made in first 5 minutes never broke during the day. Advance decline was positive. Trend is up with support at 6640. Considering yesterday's rally, a sideways movement of 1-2 days is perfectly in order. So unless markets break this level in 2 days, I will not consider any sort of trend reversal. This is not a market for shorting so keep buying the dips. I am saying this because I am getting desperate calls from people who are shorting from 6200 levels and do not believe in stoploss. Now they are paying (very rightly) for their follies. I have no target for this rally... 7200 is the nearest Fibonacci resistance level... after that who knows and who cares. Just follow the trend which is up right now and hold all positions with a trailing stoploss. Long trade on crossover of day's high at 6848F failed. Short trade was not considered as broader trend is strongly up. In a previous post, I mentioned that the "... expected correction has started or may even be ending!". Two days of lower highs and lower lows is all we got and this is enough in a bull market. Right enough, the correction ended faster than it ever started and trapped everyone who are desperately looking for an opportunity to short a rising market. A simple straight forward day.... crossover above day's high (6780F) gave an excellent and immensely profitable signal. Cover at market close. Much expected correction has started or may even be ending! Short trade on break of day's low (6745F)... cover around 6720F. There was no other trade possible. Note absence of any weakness inspite of global clues and tomorrow being a holiday. 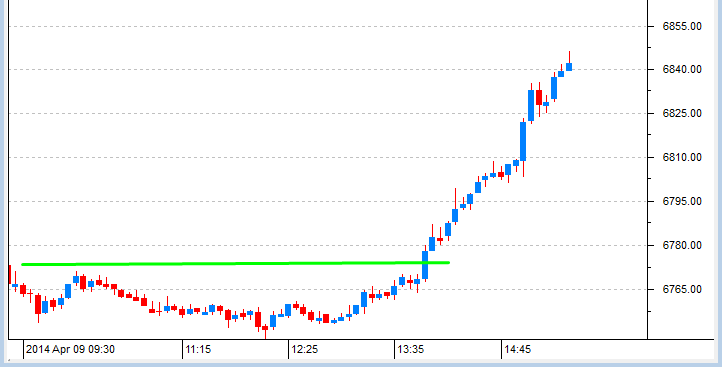 RANBAXY... an interesting trade. This stock was not on my watchlist but someone at my brokerage shorted when it was up 10%. According to him, the 10% move was not warranted and so he shorted. On daily charts, nifty formed lower high lower low... this is the first sign of the correction (yesterday's outside bar was a rough warning). The intraday charts however show a great deal of struggle to come down. Weak and rangebound day. There was only one possible short trade when nifty crossed the day's high but failed to sustain above it. Expectedly, the rangebound nature of the market limited the gains. Incidentally break of day's low (9.45 bar) is NOT a short trade (shown with arrow) as the bar closing was midway. Free Trading: 5 free trades each month, for life. Rs. 20 per order traded afterwards, regardless of the size of the trade. Applies to all segments: Cash (Equities), Futures, Options, Currency Futures and Options, and MCX Futures. Enjoy intraday leverage of 20x on equities, 2.5x on NSE F&O, 2x on NSE Currency F&O and 2x on MCX Futures. Trend is up and there are signs of some profit booking happening. Immediate support is at 12525 and then 12300. Note that while nifty is trading at lifetime highs, bank nifty has yet to cross its lifetime high of 13400. Some signs of profit booking setting in. We also had a formation of an outside bar. 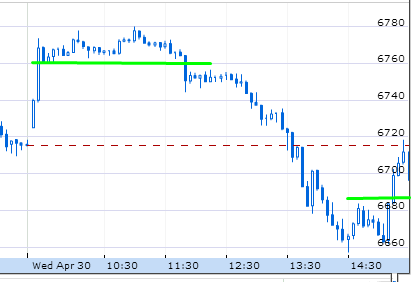 Intraday trend was down though there was not much selling. There was only one sell signal which got stopped out on a trailing SL and generated no profits. 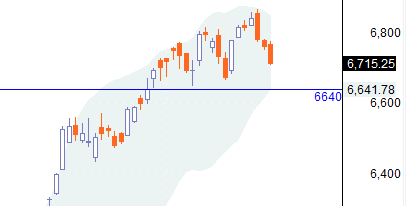 Trend is up with support at 6600-6400. Formation of higher high and higher low is still intact. Any correction would be a buy on dips opportunity. I know most people are already short or are looking for an opportunity to short. My advice - forget it unless you want to get slaughtered. 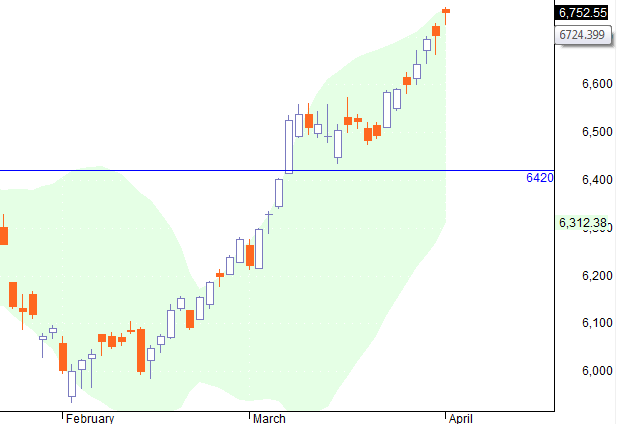 NIFTY traded rangebound but with a bullish bias. Similar pattern is being seen past few days. We have initial weakness followed by break of day's low and then the bulls step in. 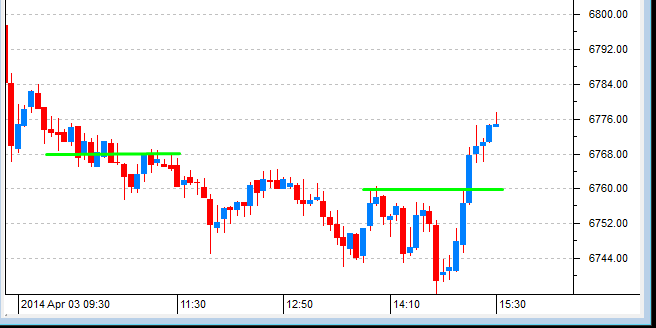 Buy above level for today is shown in green line. S&P 500 trend is up with support at 1840... resistance is at 1880. Close above this will lead to another strong rally. Note that the yellow highlighted bar is the current bar. Can you buy a stock AFTER it has already moved 10% in a day? Or say it is at lifetime high? Or at 52 week high? If yes, you are on your way to be a good trader. No signs of any correction while nifty is still maintaining formation of higher highs and higher lows intact. While a correction is overdue, it may be a short affair with the broader sense veering towards buy on dips. Past 2-3 days, markets are seeing selling followed by immediate buying. Today was no different.